The Dolce&Gabbana show that's scheduled to be in Shanghai, China on the evening of Wednesday, 21 November has been cancelled. In a matter of hours, the Dolce&Gabbana show (dubbed 'The Great Show') that was slated to be held in Shanghai, China tonight, has been cancelled. The large-scale event was to be attended by regional and international press, Chinese celebrities, as well as influencers the world over. The designers themselves—Domenico Dolce and Stefano Gabbana—are in Shanghai as part of 'The Great Show'. Dolce&Gabbana released a series of videos on Instagram as a teaser to 'The Great Show'. The trio of videos that the brand calls its #DGLOVESCHINA campaign, act as "instructional" videos on how to use chopsticks to eat Italian food such as pizza margherita, a cannolo, and a plate of spaghetti. In each video, the same model is seen struggling to use chopsticks to handle each food before finally figuring out a way to do so. The videos are in Mandarin and are captioned in Mandarin. As reported by Jing Daily, social media users in China felt that the series was "stereotypical, racist and disrespectful for Asian female[s]". 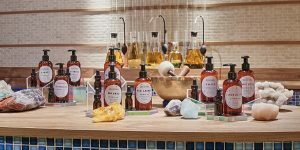 The report also took notice of alleged subtexts present in the subtitles that "referred to chopsticks as a 'small-stick' tool while called Italian food great and tasty, which made many people feel the brand is arrogant about its cultural roots". The videos were then deleted from China's social media platform Weibo but those on Instagram remained. Update: The videos were also deleted on Instagram as of 23 November. Instagram account @diet_prada posted Dolce&Gabbana's second video but edited it to feature English translations of the Mandarin subtitles. This brought further attention to the campaign and even greater outcry over the controversial execution of a campaign that's supposed to be a tribute to China. Prominent fashion influencers were quick to react negatively to the video, with entrepreneur Tina Craig (@bagsnob) calling one of the original videos "offensive and ridiculous". Screenshots of the alleged 'hacked' conversation between Michaela (@michaelatranova) and Stefano Gabbana. 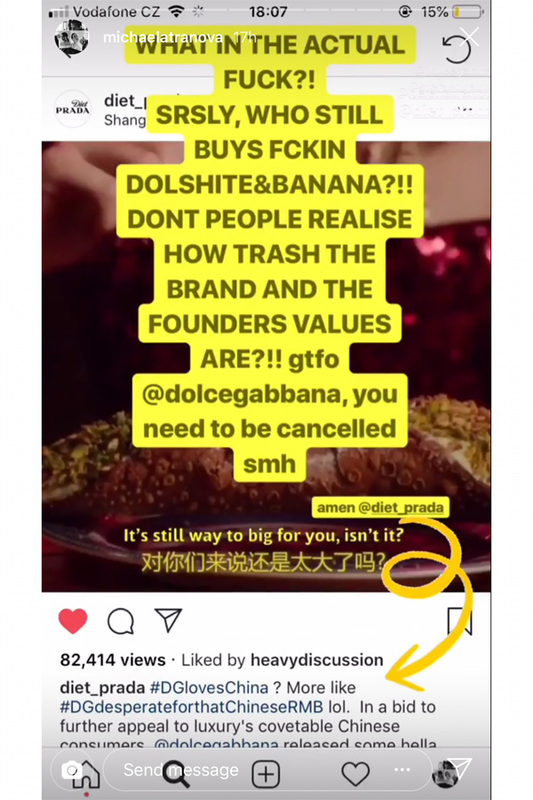 Appalled by @diet_prada's post, Instagram user Michaela (@michaelatranova) posted her thoughts regarding the campaign on Instagram Stories and tagged Stefano Gabbana. This prompted the designer to reply, which caused Michaela to engage with Stefano, who in turn attempted to defend the brand's campaign. Stefano reasoned that "if the Chinese feel offended by a girl who spells pizza or pasta with chopsticks means that those Chinese feel inferior", and called China "Ignorant Dirty Smelling Mafia". Michaela posted the entire conversation on Instagram Stories. 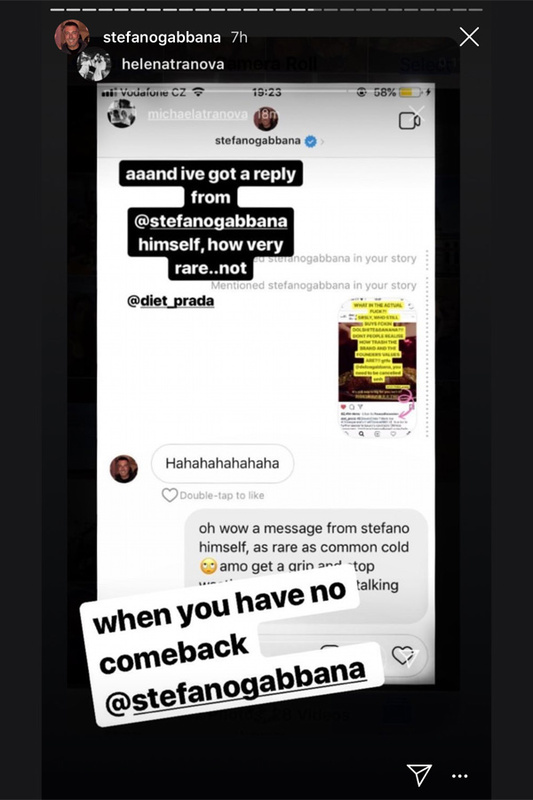 @diet_prada took screenshots of Michaela's conversation with Stefano Gabbana and reposted them. In a matter of hours, followers of @diet_prada started reporting that celebrities such as Mu Ziyang, Wang Junkai and Li Bingbing, who were invited to attend the show have decided not to. Modelling agency China Bentley Culture & Media Co. Ltd. pulled out of the show (24 models were alleged to have been scheduled to walk). It was also alleged that Angelica Cheung, editor-in-chief of Vogue China flew back to Beijing. Stefano Gabbana then posted on Instagram, saying that the alleged conversation between Michaela and him happened only because his account was hacked. However, five hours before posting that his account was hacked, Stefano reposted the start of his conversation with Michaela on Instagram Stories. Dolce&Gabbana followed up with a post of their own which reads: "Our Instagram account has been hacked. So as[sic] the account of Stefano Gabbana. Our legal office is urgently investigating. We are very sorry for any distress caused by these unauthorized posts. We have nothing but respect for China and the people of China." A screenshot of Stefano Gabbana's post on Instagram Stories, showing his acknowledgement of the conversation with Michaela (@michaelatranova), hours before alleging that his account was hacked. 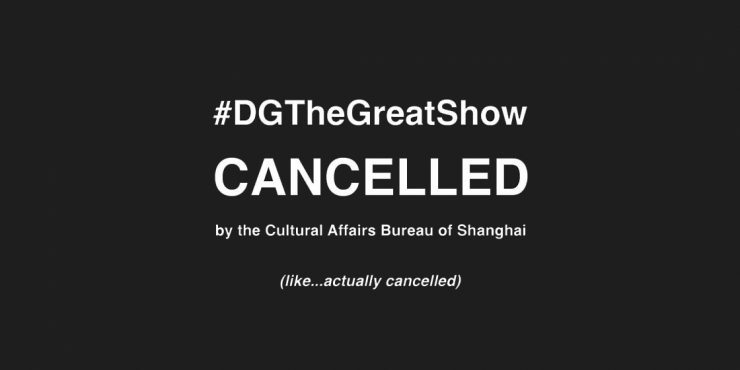 Two hours later, @diet_prada reported that the Cultural Affairs Bureau of Shanghai has cancelled Dolce&Gabbana's 'The Great Show'; a mere four hours after the account circulated the allegedly hacked conversation. And less than five hours to the scheduled start of the show. We spoke to a few people working in fashion public relations to find out how Dolce&Gabbana should move forward from this situation. Madina Kalyayeva, business development director at R.S.V.P: I would publicly apologise. Highlight it as a misunderstanding and a miscommunication. If their accounts were indeed hacked, then I would issue a press statement along the lines of: "I would never disrespect a group that is my largest consumer and the face of Dolce&Gabbana. And I would never discriminate someone who works with or for me, and wears my clothes. My account has been hacked, which is unfortunately common in this day and age. This emphasises how technology can influence the image of a brand in both positive and negative ways. I sincerely apologise that this incident has happened. I am a victim of a hacker who has deliberately shattered my image on social media, as well as in front of my audience. Please forgive this unfortunate misunderstanding." Salamander Davoudi, crisis communications expert at London-based PR firm Tancredi Group: Dolce&Gabbana are no strangers to controversy. In fact, they love to seek it out; an approach which can be very dangerous. The public outrage in this case has been immediate and widespread. Issuing a statement offering respect for China and the people of China isn't going to be sufficient. This crisis is just the beginning. They must accept responsibility, make some dramatic internal changes, and completely rethink their approach to this centuries-old culture. This is not a market they can afford to fail in. Angry Chinese netizens recorded themselves cutting up and burning Dolce&Gabbana-branded items, and posting them up on various social media platforms. One video showed a Dolce&Gabbana vest being used as a rag before being thrown into a bin. @diet_prada reported a rumour that Dolce&Gabbana might be moving forward without Stefano Gabbana. 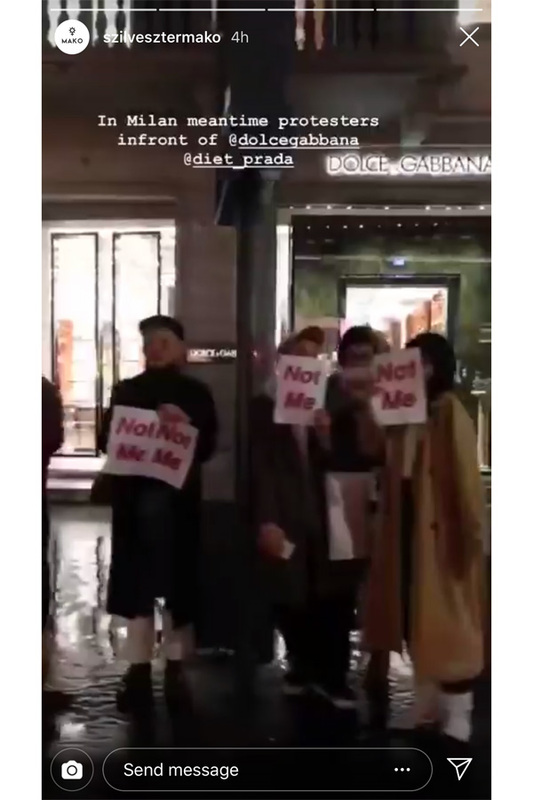 In Milan, photographer Szilveszter Makó (@szilvesztermako) posted a video on Instagram Stories of a protest outside the Dolce&Gabbana boutique along Via Monte Napoleone. Protestors held up white signs with 'NOT ME' printed in red. Dolce&Gabbana issued another apology on Instagram. This time, it was signed by both designers—Domenico Dolce and Stefano Gabbana. WWD.com reported that the Yoox Net-a-Porter Group "would pull Dolce&Gabbana products off its Chinese platforms". This means that the brand will be removed from Mr Porter, Net-a-Porter, and Yoox.com. Domenico Dolce and Stefano Gabbana both appeared in a video that was uploaded to Weibo, and apologised in Italian with subtitles in Mandarin. Stay tuned as we update this story as it unfolds.